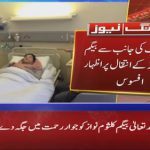 Begum Kalsoom Nawaz, wife of former Prime Minister Nawaz Sharif has expired in London. She had been suffering from cancer and was under treatment at London’s Harley Street Clinic. 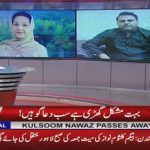 Prime Minister Imran Khan has expressed deep grief and sorrow over the sad demise of Kalsoom Nawaz. In his tweet, Khan stated that she was a brave woman. 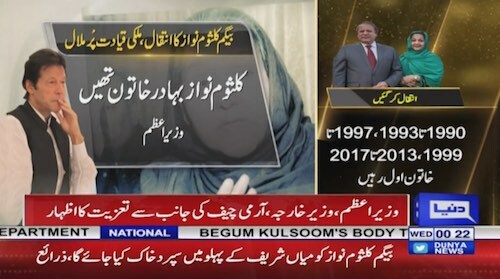 Army Chief General Qamar Javed Bajwa has expressed his grief and heartfelt condolences to the bereaved family on the sad demise of Begum Kulsoom Nawaz. 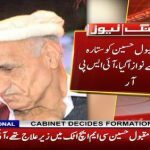 In a tweet issued by ISPR Chief Major General Asif Ghafoor, the Army Chief has prayed eternal peace for the departed soul. Foreign Minister Shah Mehmood Qureshi, Speaker National Assembly Asad Qaisar and Deputy Speaker Qasim Khan Suri have also expressed grief and sorrow over the death of Begum Kalsoom Nawaz. Foreign Minister also stated that London High Commission has been advised to provide everything to the Sharif family in their time of great sorrow.